Maureen Bray is an accredited and certified home staging professional, a former real estate investor & property manager, and a talented designer. As the owner of Room Solutions Staging, she draws upon all of those skills and experiences to advise her clients and provide them with the staging solutions necessary to be successful in any real estate market. Maureen got her start in the real estate business when she staged her own investment properties in the Portland area. Over the years she recognized the importance of property presentation and knew that it made a big difference in how buyers felt when viewing a home. 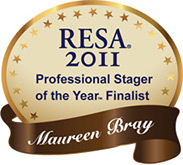 Maureen holds several international staging designations (CSP, ASP) and was elected the national Board President of the Real Estate Staging Association (RESA) for three years. She also served as the VP, Membership for the Portland chapter of RESA. As a volunteer Moderator of the Stage It Forward Forum, part of the Active Rain real estate online network, Maureen continues to promote education in home staging for consumers and real estate professionals. 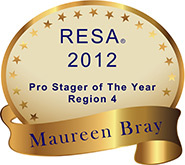 In 2017, Maureen was honored by the Real Estate Staging Association with the L.K. Polk Lifetime Achievement Award at the annual home staging convention held in Las Vegas. 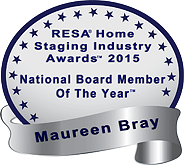 This distinction was especially meaningful because it's awarded by a majority vote of RESA stager members in North America: to honor someone who's been in the staging industry for a minimum of ten years, who's held multiple leadership positions in the association, and who's contributed to helping move the home staging industry forward in various ways. Maureen was named Top Ten Professional Stager of the Year for the United States for both 2013 and 2014, an award sponsored by the Real Estate Staging Association (the professional trade association for the home staging industry). She was also named 2012 Professional Stager of the Year for the Western U.S. Finalists for these awards were voted on by home staging peers across North America, and Maureen was selected as the winner by a panel of staging & design industry judges. Maureen was awarded the Angie's List Super Service Award for 2010, 2011, 2012, 2014 and 2016, earned by only 5% of member companies who receive their rankings and reviews from local consumers. We were also awarded "Best Of Houzz​" for 2015 and 2016 for Customer Service by Houzz, the leading platform for home remodeling and design​, selected by the users that comprise the Houzz community ​of ​active home building, remodeling and design industry professionals. ​​Customer Service honors are determined by a variety of factors, including the number and quality of client reviews ​that ​a professional received. In addition, Houzz awarded us their "​Houzz Recommended​" badge, which goes only to top-rated pros in the Houzz community. Maureen is a native of Carmel, California and has made Portland her home for many years. She also spent several years living in the rural countryside of County Limerick, Ireland, where she established a successful Bed & Breakfast business and later managed student housing at the University of Limerick. During this time she also took on several design projects for various clients while she planned her return to Portland to establish her own home staging company. Local and national media continually turn to Room Solutions Staging when reporting how home staging helps sellers in today's changing real estate market in Portland Oregon and beyond. Contact us today to find out how our staging expertise will help your home staging project or listing sell faster and for the best price. 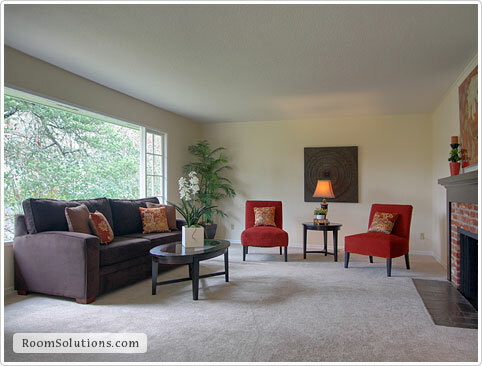 Check out our before and after home staging photo gallery for examples of our work. Our job is never done until our client is happy with the results! Thanks! We got over asking price with two offers, and a huge turnout of people for the open house. I think the staging and photos really made the difference.